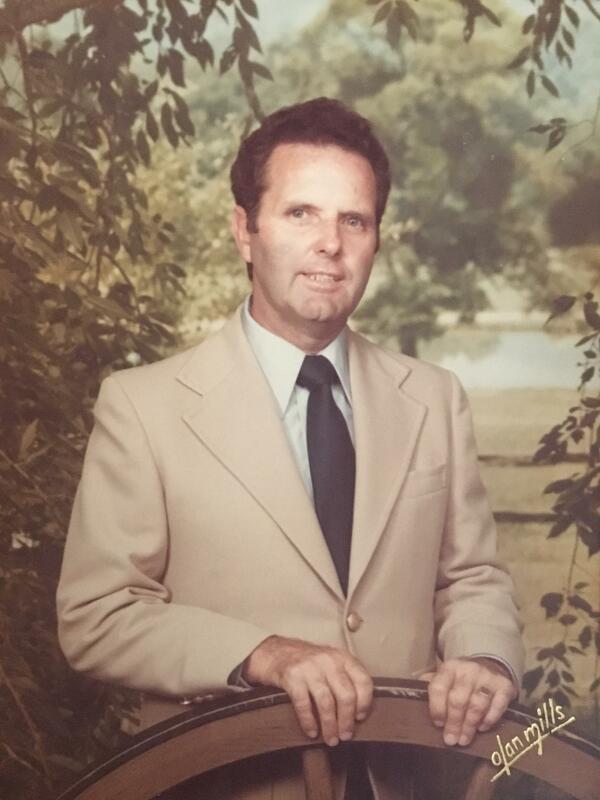 Alexander McLean Paton “Scotty” Neil, 85, of Phoenix died on Friday, December 28, 2017. With his wife of 61 years, Catherine Elizabeth “Bette” Baird, they are the parents of 3, grandparents of 16, and great grandparents of 18 and counting. 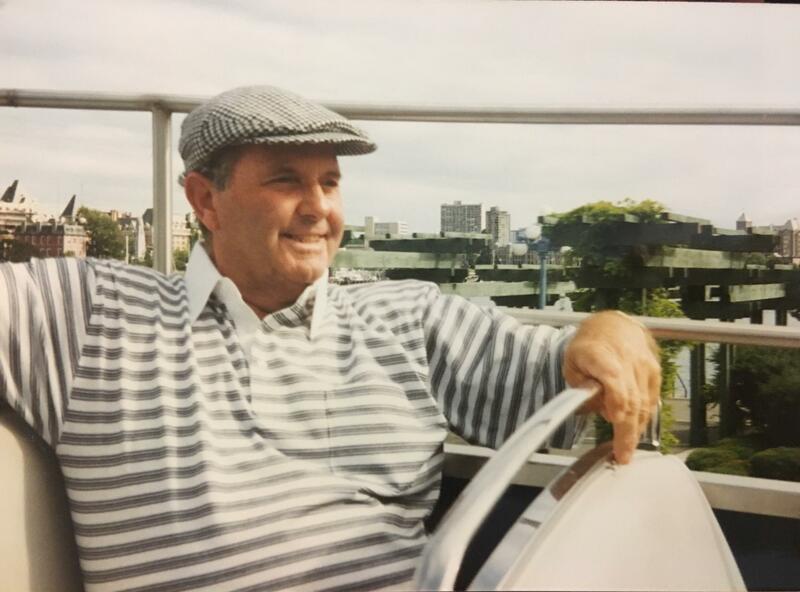 Scotty was born in Motherwell, Lanarkshire, Scotland on December 5, 1932 to Elizabeth “Bessie” Crawford Paton and John Morton Neil, the oldest of five children. He began a man’s work at the age of 15 in the same steel mill where his father was earlier crippled. Seeking more opportunity, he and his new bride emigrated to America and landed in Ames, Iowa in 1957. Life in America was very rewarding, and in 1960, the adventure brought the growing family of 4 traveling across Route 66 to Phoenix where roots grew deep. 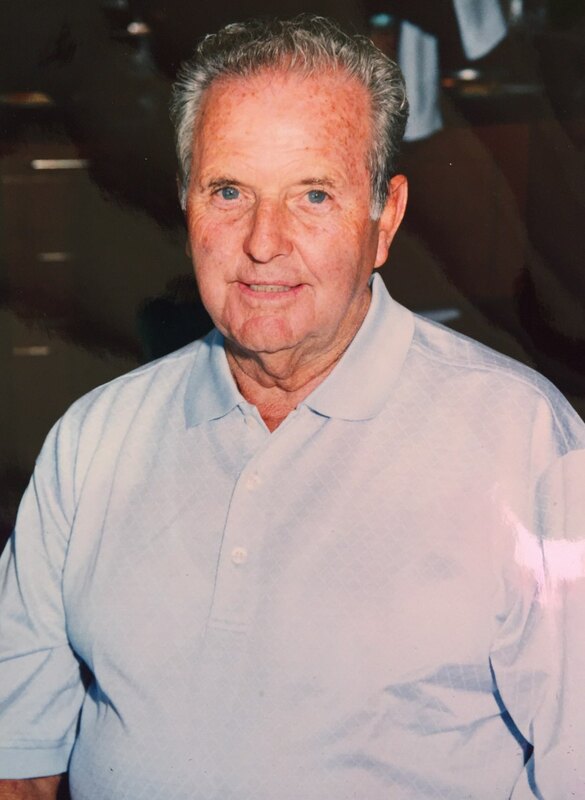 He worked to his 75th year as a bricklayer and stone mason, with many years spent as the head bricklayer or masonry contractor on some of Phoenix’s largest masonry buildings. For fun, he loved playing football (soccer) as a semi-pro player and then as a coach of successful youth teams in the Sereno League. During the summer heat, the lakes and streams of Arizona beckoned to him from the scaffolding in the blazing Arizona sun. He especially liked to sing out loud, anywhere and anytime, to the enjoyment of all around. 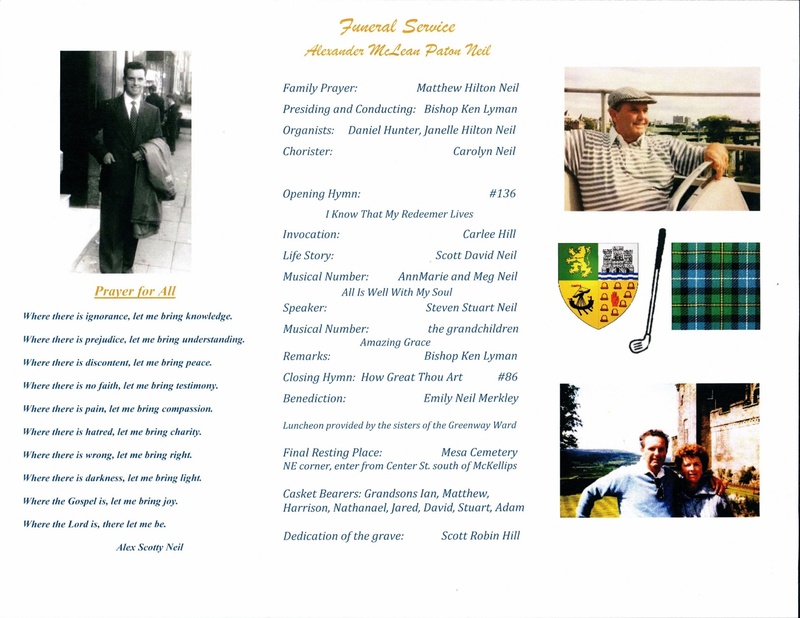 Anxious to preserve their Scottish heritage, Scotty and Bette, frequently took their children and grandchildren to Scotland and to the Arizona Scottish Highland Games, and he wore his kilt upon occasion to the amazement of both his boy and girl descendants. He lead his family in converting to the LDS Church in the mid-1960s and was a bold and humble adherent in many roles such as missionary and pastoral work, preaching Christ and Him crucified to save us from our sins. His two sons have so far served missions in Spain, Colombia, and the Caribbean. 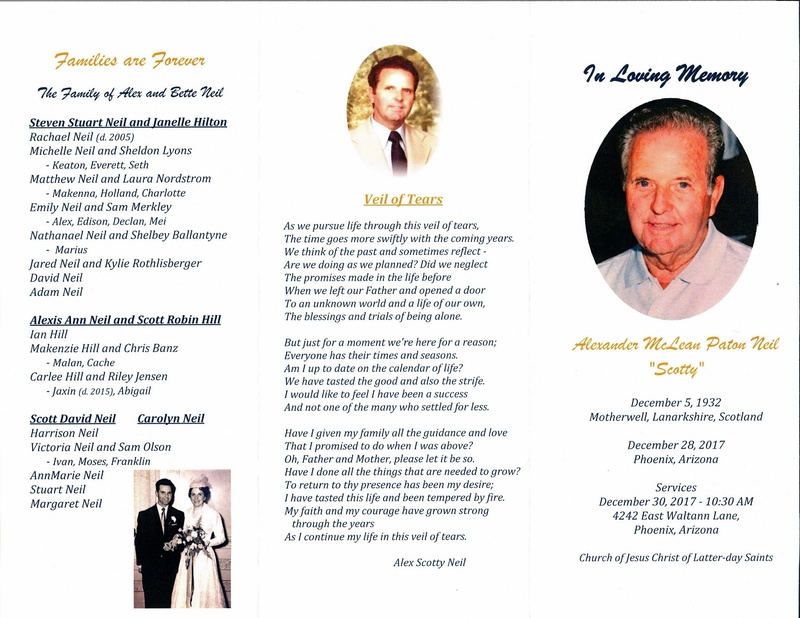 Funeral services will be held on Saturday, December 30, 2017 at 10:30 am at the LDS meetinghouse at 4242 E. Waltann Lane in Phoenix, with the preceding hour set aside for viewing and visiting the family. Thank you for loving me and your grandchildren so very very much. You never stopped loving and giving and sharing your time and talents. Your example of faith and hard work has left a legacy that will hopefully last for many generations. ‘Till we meet again.